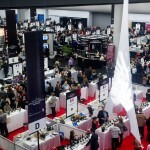 The Grande Dégustation of Montréal held from 7th to 9th of November 2013, on the Place Bonaventure. Dulong Reserve Merlot-Cabernet Sauvignon was proposed for tasting on the booth of Mark Anthony Brands, our importer in Quebec. The first day, reserved for professionals, allowed us to make taste the wine to restaurants and to the staff of the SAQ. Then, during the two last days, we had again a huge success with the public. This was a great opportunity to showcase our wine to Montrealers which is available at the SAQ since this summer.